NEWS: Asiana have introduced a new elite Tier level. Called Diamond Plus, it is designed for those passengers who will find it too hard to get to Platinum level: in effect you get almost the same privaliges, except for the VIP magazine and the upgrade coupons. 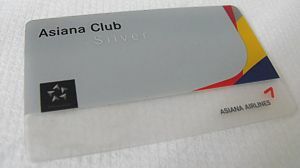 Asiana's Frequent Flyer scheme is called the ASiana Club, and is part of the Star Alliance. Asiana have a fairly standard mileage system for their Frequent Flier club. In the mileage club you essentially earn 1 mile for each actual flight miles multiplied by your Elite Bonus level. Joining is easy; it's possible to do it online. Asiana's policy is that miles expire within 7 years of posting to the account, with the only means of extending the expiration date being the booking of a ticket in that 7 year period for travel within the next year. Quite simply, if you earn points on Asiana, keep them active by flying on an Asiana flight once every seven years. Watch for Asiana's rather strange names of the tier levels, where Gold is Silver on the Star Alliance, and Diamond is Gold. This used to be the highest "common" tier level, however there is now Diamond Plus, which gets access to the First Lounges. However, Asiana do have the perk of rather easy to achieve Tier levels compared to some airlines (Lufthansa, for example). This is the basic mileage earning level. You can earn miles, but that's about it. Bronze is equivalent to Star Alliance Silver Level. It can be achieved at 20,000 miles over a 24 month period, or 30 trips over your set period. You get to check in at the dedicated Gold desk, or business class checkin desks if there is no dedicated desk, and you get an extra 10kg of luggage. You get two coupons to use the Asiana Business Class lounge in Seoul. Asiana Diamond is equivalent to Star Alliance Gold Level. It can be achieved at 40,000 miles over a 24 month period, or 50 trips with Asiana airlines over your set period. You get to check in at the business class checkin desks, and you also get lounge access on all economy tickets, on all Star Alliance services, and can invite one guest. You get an extra luggage allowance of 20kg, and 20kg on most Star Alliance operated flights. Asiana Diamond Plus is equivalent to Star Alliance Gold Level. It can be achieved at 100,000 miles over a 24 month period, or 100 trips with Asiana airlines over your set period. You get to check in at the First Class Asiana checkin desks, and you also get lounge access on all economy or Business tickets to the First Class Asiana lounge, and on all Star Alliance services to the business lounge, and can invite one guest. You get an extra luggage allowance of 30kg on Asiana, and 20kg on most Star Alliance operated flights. There are two discount vouchers that reduce the number of miles needed by 50% for seat upgrades. Asiana Platinum has no Star Alliance equivalent, but it comes with the perks of Star Alliance Gold Level. It can be achieved at 1,000,000 miles over your lifetime, and once you get here, you don't drop down again. There are two discount vouchers that reduce the number of miles needed by 50% for seat upgrades for every 100,000 miles you fly.